The deliberate use of merchandising strategies in presidential campaigns and governmental communications have in the past decade sought out ways to close the gap between the people and their candidates or government officials. 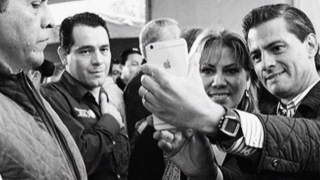 The epitome of such strategies can be found in one section of the official website of the Mexican president, entitled: “My picture with the President.” Now, 6 years into his presidency, it seems clear that the only thing president Enrique Peña Nieto has been interested in all along was looking his best with his fans. Opening: Oct. 17, 5 to 5:45 p.m.